After arriving in Charlottetown last week, summer arrived too and we have been appreciating the beautiful maritime summer weather since. Now we remember why we came north! As it turns out Charlottetown is probably one of our favourite places that we have visited in our travels and we extended our planned stay at the marina from two nights to three. 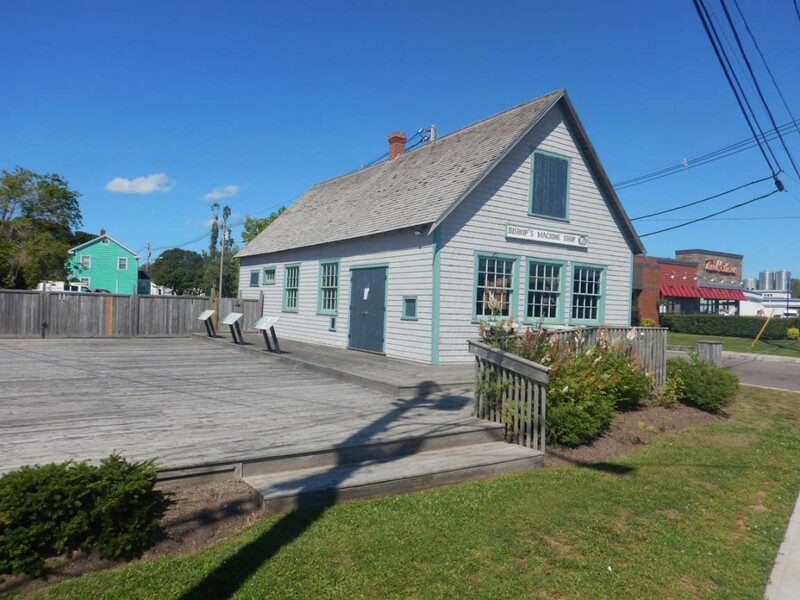 A beautiful waterfront, live music daily at Peakes Wharf, art galleries, a nice downtown in general and several live theatre options. Given the nice weather, we opted to enjoy a delightful patio dinner with live local music downtown, followed by live theatre on our extra evening in town. Then we departed Charlottetown headed towards Summerside, PEI. We didn’t expect to make it there in one day due to the light winds, so after battling an ebb tide current for a number of hours we stopped after a long 10 hour day in the old ferry terminal harbour that has since been replaced by the Confederation Bridge. The forecast southwest winds were actually from the south that evening, so unfortunately we had a notable swell pushing through the entrance to the harbour so it wasn’t the most comfortable night at anchor. 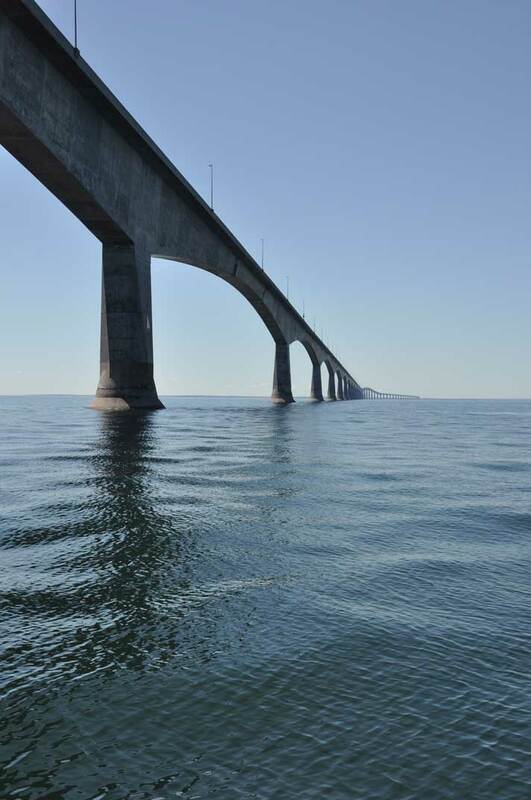 Mid-morning we set off to finish our trip to Summerside which started with our trip under the Confederation Bridge. A very impressive structure, reportedly the longest span across ice forming waters. The Pillars are massive. We arrived in Summerside mid afternoon and anchored in the wide, but deep river across from town. 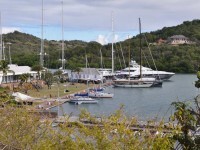 The locals from the yacht club came and went through the day, but we were the only ones that the stayed the night. We took the dinghy to town on the Sunday of the long weekend and wandered around for a couple of hours, but the town was very quiet. 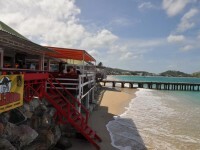 They do have a nice little boardwalk with a few shops and a few restaurants but it seems most of the town had other plans for the long weekend. 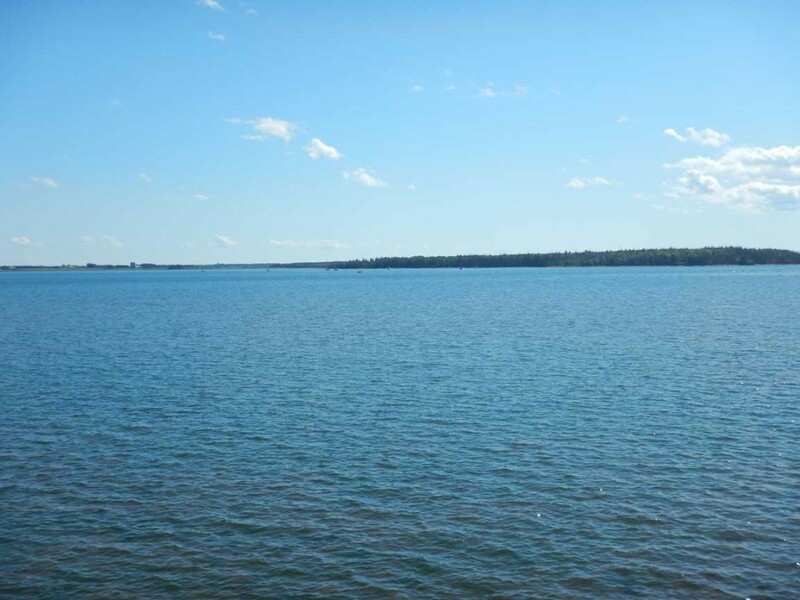 Here is the view from town to the anchorage. 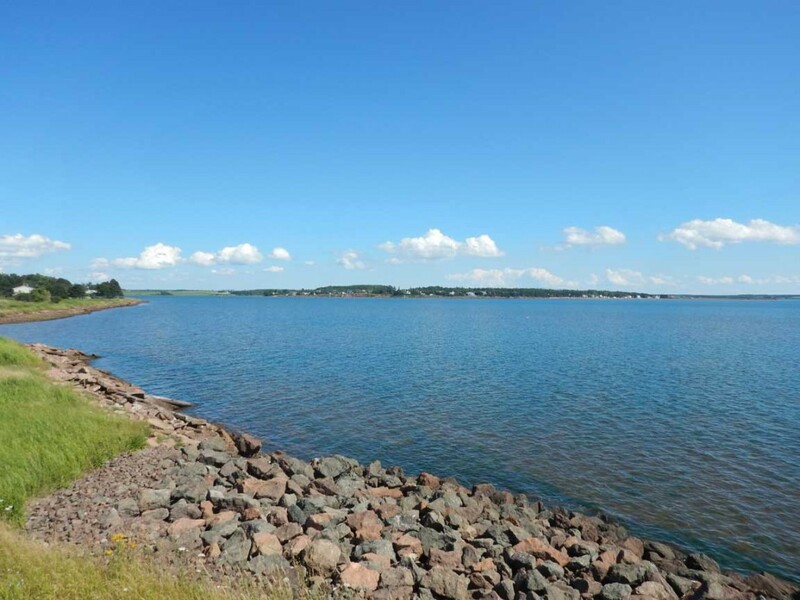 The Northumberland strait has been a challenge for our trip and if we were to return to PEI by boat in the future we would likely just plan to visit Charlottetown. 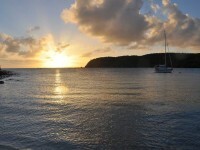 The ports or anchorages that have adequate depth for a sailboat are far apart here. 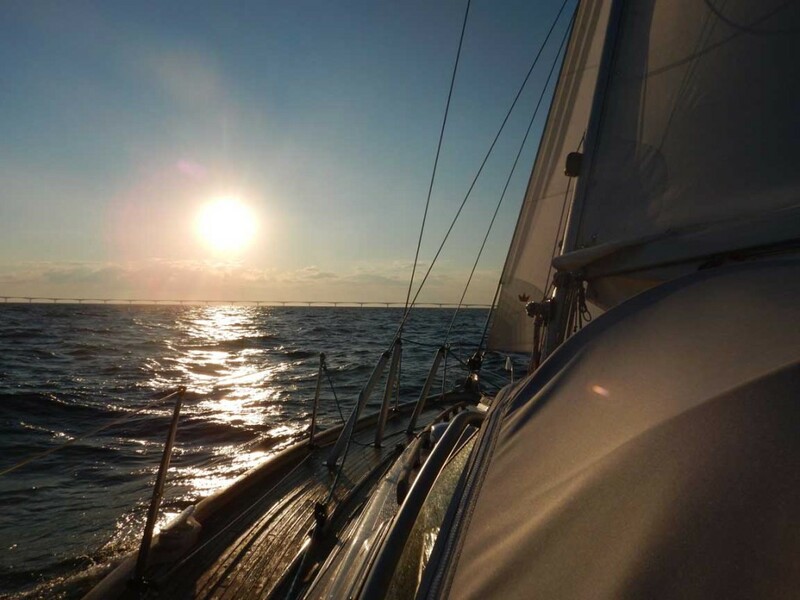 This has made for some long 10-12 hour days puttering along at 3 knots when the winds fall off and inevitably opting to motor sail later in the day to make a destination by nightfall. Here we have a forecast for 15 knot winds, but our wind instrument seems to be offering a different opinion. The shorelines between Nova Scotia, New Brunswick and PEI also influence the wind significantly. 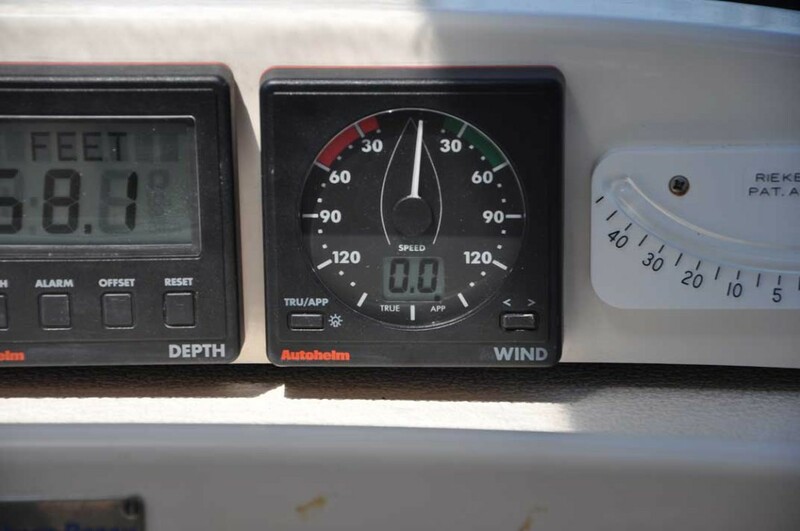 The forecast southerly winds that should have allowed us to beam reach east on our departure from Summerside, had notable easterly influences in the narrow stretch either side of the Confederation Bridge. This drove us nuts as every mile or two we had a different wind and in the end, it slowed us down enough that we were a few hours behind where we expected to be. 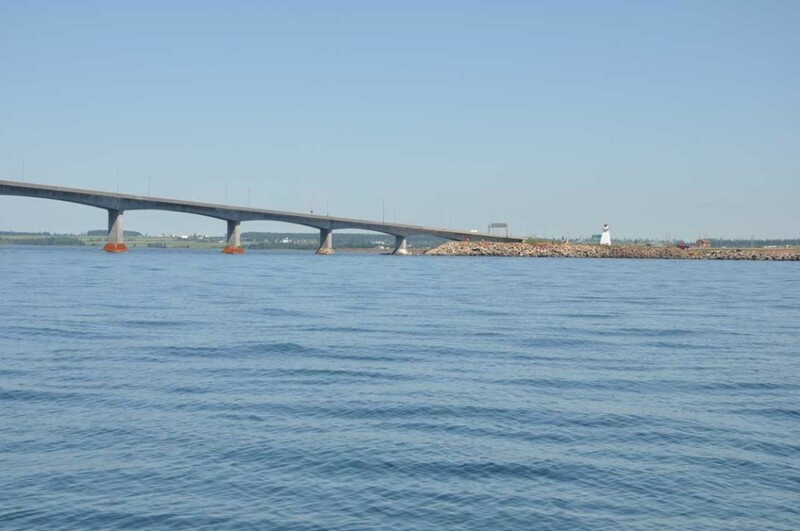 The tide floods in both ends of the Northumberland strait and between Charlottetown and the Confederation bridge is the where the tide meets. We learned this on our way to Summerside and had planned to gain a boost from the flood tide for a few hours past the Confederation Bridge and then ride the ebb tide from the intersection as we continued further east. Unfortunately our timing didn’t work out as well as we’d hoped so we had to battle the current for a couple of hours until we reached the point where the the ebb flow was with us. This somewhat reminded me of work in that for every mile we sailed, we had 30-40% taken away, just this time it was to the ocean instead of the taxman. The scenery on the shorelines has been beautiful and I had really wanted to see the Confederation bridge. Judging by the bridge traffic going by, only the transport trucks are tall enough to have a view, so visiting by boat was preferable to all the times we considered driving the bridge in the past. Overall it was worthwhile but we are eager to move on now as there isn’t much else we had planned to see in PEI. At this point we are now headed for Souris on the North-Eastern part of PEI where we are going to get a quick lift out on Thursday to change the zinc on the saildrive, the saildrive oil, clean the bottom and the propeller. With any luck the weather will cooperate and we will be off for the Magdalen islands Thursday night, arriving Friday morning. More great pictures. 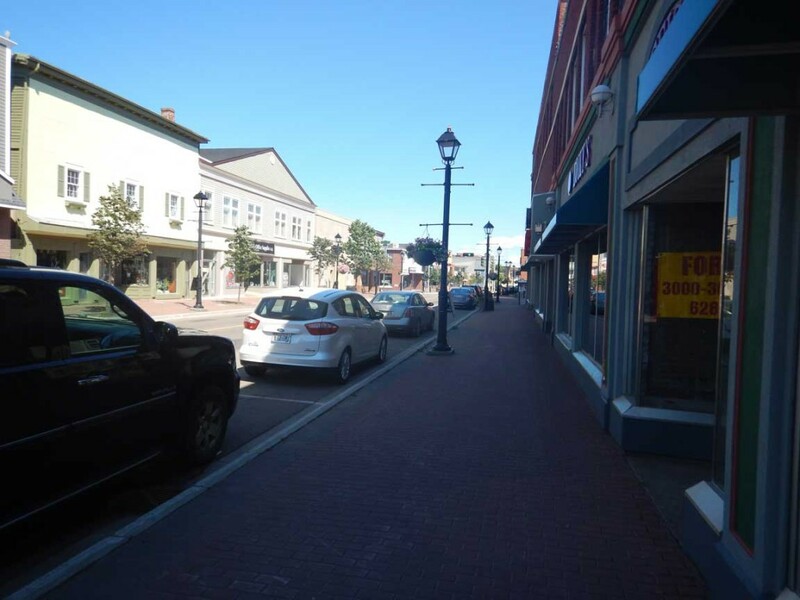 Interested in the info on Charlottetown a place we want to visit. Glad to hear summer has arrived at last enjoy. Charlottetown might just be our favourite city that we’ve visited on the boat. Prime season apparently extends through September. The cruise ship frequency increases in a few weeks, so the afternoons could get busy downtown.